About Ioanna K. Message Ioanna K.
All Athens monuments in a day. Another good tour with Ioanna and a nice drive along the coast. A lovely tour by a lovely tour guide. It was more than expected, sharing all the knowledge and being very aware of personal abilities, taking care that we managed to see everything we wanted by pacing it so that the less agile could also manage. We learnt a lot, experienced a lot and enjoyed it a lot. TOUR GUIDE RESPONSE: Thank you so much. It was very nice spending the day with you and your mother. We had an amazing day with Ioanna on the walking tour of Athens! 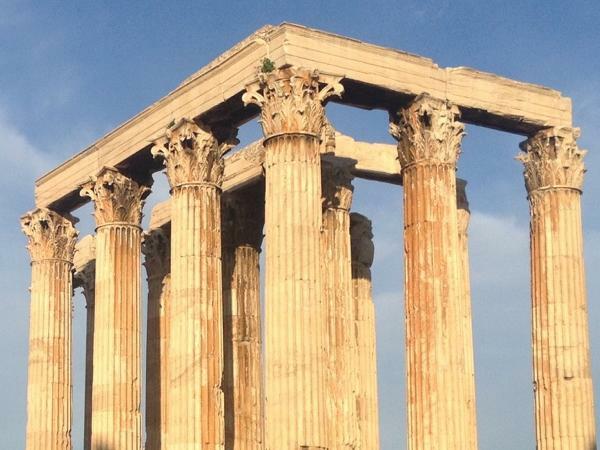 My husband, the two boys and I learned a lot about the history and got so much more out from our visit (the Acropolis, museum, the Olympic stadium and Temple of Zeus) than we would ever had if we explored the sites in our own. She really tailored the experience to what we were interested in, and was very knowledgeable !!! Highly recommend her guided tours!!! Ioanna is incredibly knowledgeable, fun and very personable. We were a group of four (two adults and two teenage boys) and every one of us loved the tour and were engaged and interested the entire time. I can't imagine being able to fit in all the historic sites in Athens and learning as much as we did in that amount of time. Worth the price. We highly recommend hiring Ioanna if you want to really learn what Athens is all about - historically, mythologically, and present day. Ioanna was just amazing, she was very educated in all we saw but also so friendly and just a joy to spend the day with. I would use her again and tell anyone taking a tour of Athens to request her. Fantastic tour and tour guide! Ioanna's English was perfect. Her descriptions were interesting, informative and with humor. She patiently, efficiently worked oround our schedule...we were delayed. I highly recommend Ioanna. TOUR GUIDE RESPONSE: Thank you for your feedback. It was very nice to meet all of you! Ioanna was personable, bright and very well informed on Athens. Her background in antiquities restoration brought so much to her narrative. She structured the tour so that in a way that the information built as the day went on and so much of the history came together in more clear way for us. I would highly recommend Ioanna to you. To top it all off, are out request, she recommended an excellent restaurant and booked a table for us. Thank you, Ioanna, for an early an excellent experience. TOUR GUIDE RESPONSE: Thank you very much. It was a pleasure meeting you all. Fantastic GUIDE Ioanna. Helpful, patience, fluent English with a very clear Accent. For the driver, is very good one. AS a general very good service and superb. TOUR GUIDE RESPONSE: Thank you very much. I am glad you’ve enjoyed your days in Greece. Ioanna was fabulous. She and the driver accommodated our special requests and we had an amazing day touring the sites of Athens. All ten in our party highly recommend her and the tour. TOUR GUIDE RESPONSE: Thank you very much. I am glad you’ve enjoyed our day. had a wonderful day with iaonna. we met at the hotel and off we went. at her suggestion we headed to sounio first to avoid the crowds around athens and the acropolis. beautiful drive down the coast and a very informative walk around the ruins. then back to athens for a drive around ending up in the placa for lunch with iaonna. she took us to a beautiful spot under the trees and umbrella's with excellent food. then to the acropolis. Ioanna was very kind to us and we took a nice slow route. TOUR GUIDE RESPONSE: Thank you for a nice day! Our 8-hour tour around Athens with Ioanna was fantastic! She was fun, very informative, kept a good pace without feeling rushed and asked for and listened to our questions, needs and wants. She also gave us great recommendations for lunch mid-tour. We were sorry to say good-bye at the end of the day. It was a great way to see the highlights of Athens in a day, and we highly recommend Ioanna as your guide around Athens! TOUR GUIDE RESPONSE: Thank you so much for your kind words! It was a pleasure spending the day with your family. TOUR GUIDE RESPONSE: Thank you. It was such a pleasure meeting you all. Ioanna was very knowledgeable very pleasant and knew all the tricks so we didn't have to wait in long lines which was greatly appreciated. TOUR GUIDE RESPONSE: Thank you very much. Very comprehensive tour. She was able to tailor the day to our group of 6, including school age children and teens. My tour adventure with Ioanna was top notch, educational and thorough. Ioanna is a real pro and passionate about the guest experience. Just perfect. She dialed in on my preferences and nailed the tour outcome. We covered so many sites and Ioanna provided amazing historical and local insight. It was fast paced and so much fun. Ioanna is a guide's guide. Thanks ToursByLocals for associating with such talent and providing an outstanding guest experience. Ioanna is THE BEST!! This is my second tour with her and driver Vasily, the first was in 2015. She is very knowledgable and flexible and friendly, tailoring the tour to our needs. In addition to the Acropolis, Temple of Zeus and Acropolis Museum, we saw the changing of the guard at Parliament and drove up the peak looking back at the Acropolis. I highly recommend Ioanna!! TOUR GUIDE RESPONSE: Thank you very much. It was so nice seeing you again. What a wonderful day we had in Athens! TOUR GUIDE RESPONSE: Thank you Sidney! What a nice day it was! We had an absolutely wonderful guided tour of the Acropolis and surrounding area with Ioanna. I admit she was the first tour guide we have ever hired in our many years of traveling. It was better than I ever imagined. Without her our visit would have been devoid of facts and stories which brought each rock and ruin to life. She blended the details of the areas history, mythology, politics, religion, geology, and culture together to provide us knowledge and feeling - need I say more? Thanks! Outstanding tour guide! Ioanna speaks perfect English, is extremely knowledgeable, and brings real passion and excitement to the tour. We have partipated in dozens of exclusive family tours on all 7 continents over the past 20 years and she is one of the best! We will specifically request her when we return to Athens. Thanks! Dr. R.
TOUR GUIDE RESPONSE: Thank you very much. It was a pleasure meeting your family. Ioanna was well-informed, and led the tour at an appropriate pace. She was able to answer all of our questions, and offered valuable insight into the artifacts we viewed. She spent time at the beginning asking us questions about our knowledge of sites in Athens, and was then able to tailor a tour just for us. We would take another tour from her. Our tour guide was exceptional. Ioanna displayed outstanding knowledge and her English was very good. I would give Ioanna the highest recommendation and truly appreciated our tour with her. The vehicle driver from Olive Sea was also of a high quality. TOUR GUIDE RESPONSE: Thank you very much. Hope you have wonderful time. We had a great tour with Ioanna, her English was excellent, she explained things well, was very time efficient. I highly recommend her for any of your tour needs. Ioanna was a superb guide for our half-day tour of historic Athens. She provided interesting, informative and intelligent commentary on everything we visited. She encouraged and thoroughly answered all questions, quickly accommodated our requests and helped plan the route. She was friendly, enthusiastic and well-versed in her subjects. I highly recommend her services! TOUR GUIDE RESPONSE: Thank you so much! It was a wonderful morning. TOUR GUIDE RESPONSE: You are very welcome. It was my pleasure. Enjoy your days in Santorini! Excellent and competent tour guide. Very knowledgeable and experience in guiding through Athens. We covered everything in our planned itinerary and she offered helpful tips in Athens dining and sightseeing in Santorini and Crete islands. I would highly recommend her as a tour guide. TOUR GUIDE RESPONSE: Thank you very much. Hope you have enjoyed your holidays in Greece. A wealth of information which helped us understand the exhibits sonmuch better. Thank you for a wonderful tour! Ioanna is one of the best guides we've ever have with Tours by Locals. She was extremely knowledgeable and did a wonderful job of tying all the information together. We had nine people on our tour ageing from age 72 to 13 and all enjoyed her presentation. We would highly recommend Ioanna. TOUR GUIDE RESPONSE: Thank you very much. It was such a wonderful day! Ioanna gave us a wonderful tour of Athens. She was professional, friendly, and informative. She was accommodating to our family, kids included. She was a terrific ambassador to the city! She mapped out a day for us filled with history and great stories of mythology. We learned a lot about Athens' past and present. I highly recommend Ioanna, and thank her for a memorable day. TOUR GUIDE RESPONSE: Thank you very much! Hope you enjoy your journey in Greece! Ionna taught us so much on this tour and it really helped us gain an understanding of Greek art from the beginning through the ages. Highly recommend. TOUR GUIDE RESPONSE: Thank you very much! Hope you enjoy your trip to Europe! One of my favorite guides! With all the miles of walking she did amazing especially expecting:) So knowledgeable and fun to spend time with. TOUR GUIDE RESPONSE: Thank you very much! Ioanna was amazing. She was so knowledgeable, personable and considerate. Our driver was also amazing and took great care of one of our party who was not able to join all of the walking components of our tour. I would highly recommend this tour. TOUR GUIDE RESPONSE: Thank you very much! What a wonderful day I've had with your family! Pleasure meeting you all. And at last..the sun is out! Ioanna provided a wonderful service to our group of 5 people. We had a special need as my 92 year old mother was not able to climb stairs. Ioanna modified our tour plan such that she could enjoy this first two hours with the help of a driver. The remainder of our group walked the ancient sites, enjoying and learning from her expert knowledge of the ancient world. She was outgoing, patient, and generous with her time. A great way to appreciate Athens, its history and people. Thanks! TOUR GUIDE RESPONSE: Thank you very much! Wish you all the best! Excellent knowledge of the city and its history. Adjusted the tour to our needs and pace. We had an amazing tour of Athens and learned a lot story behind the meaning of the various gods and temples. Wonderful tour overall. I would highly recommend Ioanna and would definitely use her again if we come back to Athens. TOUR GUIDE RESPONSE: Thank you very much. It was a pleasure meeting you both. Ioanna was incredible!! She made the whole experience come alive! Her English was excellent, and I am sure that she is fluent in her other languages. She made it very easy to see all of the important sites within our time constraints. Her knowledge of the history was fantastic. Giving us a picture of daily life in ancient times as well as now, Christos, our driver was great. Picking us up and dropping us off near the sites. Thank you for making this a prefect visit. I will see you soon! TOUR GUIDE RESPONSE: Thank you so much! Hope we will meet again! Ioanna was so knowledgeable and down to Earth. She paced us perfectly and found shade when possible. She made our Athens tour the best tour we had. I would highly reccomened this tour. We learned so much in a short period of time. Would NOT do Athens without a guide. TOUR GUIDE RESPONSE: Thank you very much! I've had a great time with you too! Ioanna was our guide and she was absolutely exceptional! She had boundless and detailed knowledge about the history of Athens and was wonderful with our two kids (7 and 9). We spent 4 hours with her and every minute was a pleasure. I would highly recommend her to anyone contemplating a tour of the major archaeological sites of Athens. Her English was perfect and she really timed the stops at each site perfectly. Thank you Ioanna!!! TOUR GUIDE RESPONSE: Thank you very much! It was a wonderful day for me too! Ioanna was fantastic. Gave us plenty of time at each site we visited, answered all of our questions and was very friendly. She has extensive knowledge of Greek history, it's architecture and made the entire tour very interesting! I would highly recommend her! Ioanna was very knowledgable with good spoken English. She was happy to tailor the session to what we wanted. Well worth the money! TOUR GUIDE RESPONSE: Thank you very much. Pleasure meeting your family. Eugenia had to step in at last minute when my scheduled guide had an injury. She was extremely knowledgeable, energetic and nice. She spent time at the end writing down locations of places not on the itinerary that she thought would be of interest to me. I recommend Eugenia very strongly. TOUR GUIDE RESPONSE: I am very glad you've enjoyed the tour with Eugenia. I am going to pass the feedback information to her and I thank you in advance from her. Thank you for your understanding and I am really sorry again for the inconvenience. Hope you will enjoy your cruise. Ioanna made this visit to Athens so much more enjoyable, this was my third time in Athens, some of the guys in our group were visiting Greece for the first time, and I decided to have a profesional guide with us and Ioanna really delivered!! She gave us the perfect tour, always helpful and very knowledgeable. It was a real pleasure to have her, we were really lucky. I been traveling a lot the las 20 years, Ioanna is one of the best tour guides I ever had!!!! TOUR GUIDE RESPONSE: Thank you very much. It was a wonderful day for me too! Best decision of the trip!! The content was wonderful, Ioanna was so informative and the site was remarkable. The best part was being able to set the pace for our group - bathroom breaks, a moment in the shade, moving slowly for my 80 year old mother - all no problem. Ioanna was a delight and made logistics easy. We could hear, we could rest, we could ask questions - we would highly recommend this experience to everyone. It added so much to our enjoyment of the Acropolis. TOUR GUIDE RESPONSE: Thank you very much! Such a pleasure meeting you all! Ioanna was wonderful! She had great knowledge of the history of the places, took time to answer questions and was considerate of our needs. I would definitely choose her again to be our guide. TOUR GUIDE RESPONSE: Thank you very much. It was very nice meeting both of you. Ioanna was absolutely wonderful. She was "off the charts" knowledgeable about Athens and its history. In addition, she was extremely charming and helpful about the rest of our trip helping with dinner recommendations and other sites to see! We would highly recommend Ioanna! TOUR GUIDE RESPONSE: Thank you! I am very glad you've enjoyed our day! This was definitely the way to see the Acropolis, the new museum, and central Athens. A great introduction for the first time visitor, and doing it with Ioanna let us customize just what we needed to see and do. Ioanna was smart and very knowledgeable. We learned a lot! TOUR GUIDE RESPONSE: Thank you very much. I hope you've enjoyed your cruise! Our family (11 & 9 yo kids) had the pleasure of spending a day with Ioanna. Her experience and knowledge added to the majesty of the sites that we saw. She kept the kids engaged by asking them interesting questions and then having a fun quiz at the end which they thoroughly enjoyed. We would recommend her to anyone. TOUR GUIDE RESPONSE: Thank you very much. It was such a pleasure meeting your family! Ioanna made history come alive through artifacts at the museum. Her stories and her knowledge helped to keep her attention on all of the rooms. We left the museum with an excellent foundation on the progression of art through the Greek culture. A thorough and enjoyable tour. We would recommend it to anyone. TOUR GUIDE RESPONSE: Thank you very much. It was such a pleasure to meet you and your family. Happy Holidays! Ioanna took us on a lovely tour of the museum. She has great depth of knowledge but also knew how to reach my sulky 14 year-old by drawing on his knowledge of movies to bring the museum to life for him. I wish I could go back again and spend more time exploring Athens in her company - she is passionate about Greece and is eloquent, generous and captivating in her sharing of her knowledge. TOUR GUIDE RESPONSE: Thank you very much! It was really nice meeting your family. Ioanna was the perfect guide for our day in Athens! She left us feeling educated in ancient & modern history and culture - politics, religion, mythology, architecture. She used a microphone in the van, had a driver who dropped us off & then showed up when needed, was patient with our questions, & kept us on pace for our busy day. In addition to the ruins, we enjoyed the museum, & our lovely authentic lunch break. Not only was Ioanna a great tour guide, we agreed that she would be fun to hang out with! TOUR GUIDE RESPONSE: Thank you very much! I had a great time with you too! Ioanna was well organized and guided us through the 'crowds' in Athens while avoiding the long lines with precision. Her knowledge and enthusiasm of Athens and the culture and history were outstanding. TOUR GUIDE RESPONSE: Thank you very much. It was my pleasure meeting you all. Joanna was enthusiastic, interesting and informative. She brought the Acropolis to life with story telling and little nuances about the architecture that would have gone unnoticed. She even made dinner r3servations for us.My wife and two daughters had fun. TOUR GUIDE RESPONSE: It was nice meeting your family. Thank you very much. Ioanna was fantastic. I would recommend her to anyone. Professional, courteous, knowledgeable, personable, prompt...I could keep going. Excellent guide and an excellent tour. Thank you. TOUR GUIDE RESPONSE: Thank you very much. It was so nice meeting you and spending a day with you. We loved Ioanna's tour. She was very friendly and knowledgeable and led us on our own timing around the Acropolis and the plakka area. TOUR GUIDE RESPONSE: Thank you. It was very nice meeting you. We had a delightful and fascinating tour of the acropolis. Ioanna is personable and extremely knowledgeable about not only facts and dates but also the lives and culture of ancient Athenians, the technology of construction, and the art and architecture that make the acropolis such a treasure. TOUR GUIDE RESPONSE: Thank you very much. I am glad you've enjoyed our tour in Athens. Ioanna was brilliant in every way! She is expert and enthusiastic at providing tours in her native homeland. She also goes the extra mile to care for your needs and make your visit smooth and amazing. TOUR GUIDE RESPONSE: Thank you very much. It was really nice meeting you both. We visited Athens at the conclusion of a 10-day bicycle tour of the Peloponnese which included several archeological sites. In Athens, Ioanna was our guide for 1 1/2 days for the Athens Highlights tour and the National Archeological Museum. She made an effort to relate the things we saw in Athens to the sites we had visited on our bike tour, giving us a very complete understanding of Classical Greece. She has a great personality and even made dinner reservations for us at a wonderful restaurant. TOUR GUIDE RESPONSE: Thank you very much. All the best for you. Ioanna is a fantastic guide with exceptional English. She was very responsive to our requests in advance of the tour and completely delivered each site while navigating the crowds (and heat) with exceptional skill. Ioanna made everything come alive for our family of 6 and added surprises along the way like changing of the guard. She speaks confidently as a native Athenian. We shared a delicious, authentic meal at one of her favorite places. When you visit, choose our new friend Ioanna as your guide! TOUR GUIDE RESPONSE: Thank you very much! What a wonderful family! It was a lovely day for me too. TOUR GUIDE RESPONSE: Thank you very much. Good luck with your photos! Ioanna was a great guide. We had a very short time in Athens and Ioanna made sure we made the best of our time. She was organized, knowledgable, and very pleasant. We would recommend her to anyone who visits Athens. TOUR GUIDE RESPONSE: Thank you very much. It was a nice day. My daughters (adult) and I used tours by locals for the first time. Ioanna was the best!! She not only packed in a full day of sights in our small window of time, but she's delightful to be with and we highly recommend her. She provided the perfect tour for our time frame and interests. She also chose a great taxi driver, Chris, who we highly recommend as well . Ioanna provided a perfect day in Athens for us. I would definitely recommend tours by locals and most definitely recommend Ioanna. TOUR GUIDE RESPONSE: Thank you very much. I had a great time with you ladies! All the best for you. Excellent tour. Outstanding guide. Ioanna K. was extremely knowledgable, capable and caring. Her tour was absolutely outstanding; her knowledge was incredible. She answered in depth questions with facility. After a pick-pocketing experience Ioanna allowed us to change the tour start at the last minute, and was very sympathetic with the multiple victims. She helped us after the tour was completed, by providing recommendations for activities in the Greek Isles, and arranged transportation for us. TOUR GUIDE RESPONSE: Thank you very much. I am glad you 've enjoyed our tour. It was a pleasure spending the day with all of you. Our entire group thoroughly enjoyed our tour of Athens with our guide Ioanna. She gave us options and suggestions that made everything easy. Ioanna was very informative and knowledgable. She arranged a very comfortable and clean mini bus for our group. I would recommend this type of tour to anyone traveling by cruise ship or staying in a hotel Athens. Thanks Ioanna! TOUR GUIDE RESPONSE: Thank you! Nice meeting you all! Today Ioanna took me for a wonderful tour of the Acropolis and its surroundings and I highly recommend her. -She was unfailingly friendly, knowledgeable, and professional; everything one hopes for in a great tour guide. Next time I need a guide in this part of Greece, I will seek her out. Ioanna was a superb guide, very knowledgeable and a joy to hang out with for half the day; really appreciate the Acropolis Museum tour, the Acropolis itself, and other bits of trivia and guidance for the rest of our stay in Athens. TOUR GUIDE RESPONSE: Thank you very much. It was a pleasure meeting you. I am glad you enjoyed our tour in Athens. Superb tour. Ioanna met us at the cruise terminal in Piraeus and we went by taxi to the Acropolis. Ioanna was completely flexible in tailoring the itinerary to our interests. We visited the Acropolis, New Acropolis Museum, Temple of Zeus, Olympic Stadium and Plaka area for shopping and lunch. Ioanna provided an engaging commentary on both ancient and modern-day Greece. She maintained a perfect pace--brisk enough to cover all the sites of interest without ever feeling rushed. Highly recommended! TOUR GUIDE RESPONSE: Thank you very much! Happy New Year! All the best for you and your family! Ioanna was wonderful on this tour. I had already toured the Acropolis and she was ready and able to accommodate and present an altered plan. She is extremely knowledgable about the sites visited and about Athens in general. She handled my touristy questions with grace and aplomb and made me feel at home. She gave great dining suggestions and generally acted as a local ambassador to Athens. That was exactly what I was looking for. TOUR GUIDE RESPONSE: Thank you very much! It was a nice day for me too. Hope you will enjoy your days in Greece. I cannot say enough about Ioanna - she was friendly, accommodating, and incredibly knowledgeable about not only the history but also Athens itself. We saw and learned so much in 3 hours at our desired pace. Why anyone would go on a cruise group tour as opposed to being taken around by an experienced, friendly and reliable guide like Ioanna is beyond me. She was well worth it, and we could not have spent 3 hours any better! TOUR GUIDE RESPONSE: Thank you very much! I am really glad you 've enjoyed our morning in Athens. It was a pleasure meeting you. Fantastic! Super flexible, incredibly informative, and genuinely enjoyable, I highly recommend this tour by Ioanna. If you only have one day to see the sites in Athens(I did), this is the way to do it. If you have more than one day, double down! I do a lot of traveling, and I don't think I've ever had this great a touring experience. TOUR GUIDE RESPONSE: Thanks so much! I had a great time with you as well! Ioanna was the best tour guide that many in our group had experienced. She is professional and personable and we enjoyed her insights and ability to answer our questions. Definitely consider her for your Athens tour options. TOUR GUIDE RESPONSE: Thank you all very much! Ioanna was very accommodating with our various needs and interests. She paced herself well and was interesting and very kind and most importantly--authentic. Our 11 year old son loved her interactions with him as did our college age sons--she had the right touch for each of us. Excellent!! TOUR GUIDE RESPONSE: Thank you very much! Enjoy your days in Santorini! It was a pleasure meeting you! Ioanna was knowledgable about Athens. We learnt a lot from her. Her English was exceptional and was very clear. Thank you, Ioanna. TOUR GUIDE RESPONSE: Thank you! I am glad you 've enjoyed your day in Athens. Ioanna was a wonderful guide. Just two weeks before the trip, my fiancé broke her foot and was obviously a bit limited in mobility, but Ioanna was able to help us improvise so that we got to see absolutely everything on our list. Her knowledge of the sites and history is wonderful and she is just a pleasure as someone to spend a day with (we have had some guides who knew there stuff but were not great company). Tours by Locals also did a great job with pre-tour communication/questions. TOUR GUIDE RESPONSE: Thanks so much for your kind words! I hope Linda gets well soon. Pleasure meeting you both! All the best for you in the future! Ioanna was thorough and effective with our family of five. She patiently waited as the children got into their touring mindset, listened to all of us quite well and navigated the crowds with exceptional skill. Most importantly, Ioanna made the Acropolis and all of the surrounding spots come to life with the detailed facts that she shared. She answered all of our questions and brought together the different places and eras. We had an excellent day with her! we will recommend her to friends. TOUR GUIDE RESPONSE: Thanks so much! I am glad you all enjoyed our day in Athens! TOUR GUIDE RESPONSE: Thank you very much. I am glad you 've enjoyed the tour. TOUR GUIDE RESPONSE: Thank you very much! It was my pleasure working with such a nice family! TOUR GUIDE RESPONSE: Thank you! It was nice meeting you! What a fabulous introduction to Athens by Ioanna for our family. We chose Ioanna as she seemed very child friendly (our kids are 13, 11 and 8)and we were right. Ioanna kept our children interested and engaged, testing their knowledge of ancient Greece as she knew they had all studied it at school. She even managed to get our 8 year old to want to go in the Acropolis museum! The pace of our tour was perfect and adjustments were made as and when necessary to cater for how we felt in the heat of the day. TOUR GUIDE RESPONSE: Thank you very much! It was nice working with such a wonderful family!